Some argue that the Millennial generation struggles when it comes to mastering basic financial skills. Gerri Walsh, the president of the Financial Industry Regulatory Authority, recently said that “far too many Millennials trying to cope with these economic conditions have low levels of financial literacy.” The Teachers Insurance and Annuity Association – College Retirement Equities Fund stated that there are large gaps in Millennials’ financial education and knowledge. 1. Millennials are deal shoppers. As Nielsen reports, nearly 70% of Millennials feel they don’t earn enough money to live their desired lifestyle. With their small paychecks, Millennials are always on the lookout for deals. Forty-five percent of Millennials buy what’s on sale instead of their favorite brand. Deals make up more of Millennials’ spending—31%—than for any other generation. Out of the top 20 apps Millennials use that are focused on shopping, 11 are discount focused, including Groupon, Shopkick, and The Coupons App. Millennials are committed to finding the best deal out there in order to stretch their income as far as possible. 2. Millennials are saving for retirement at a much earlier age. 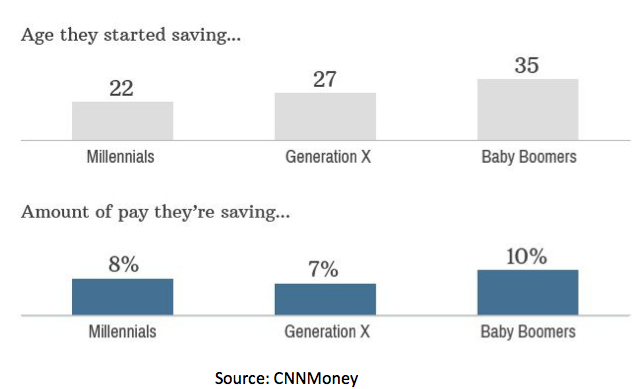 On average, Millennials started saving for retirement 13 years earlier than Baby Boomers. They save more than the generation before them (Generation X) even though they are further away from the age of retirement. The primary reason for this is Millennials are aware that Social Security will most likely not be around for them to use. Of those surveyed by Wells Fargo, 37% do not believe any of their retirement income will be provided by social security, and only 5% think it will provide over half of their income. Understanding that Social Security will not fund their retirement means Millennials can start saving more money earlier to be able to retire comfortably. 3. They have seen the negative effects of not being financially savvy. This generation has lived through the worst economic recovery since the Great Depression. The impact of this will be long-lasting—similar to the effect of the Great Depression on the Silent Generation. Millennials have fewer credit cards and carry a credit-card balance of $2,700 on average, below the national average of $4,500. They are conscious of keeping debt to a minimum, especially since they already have an average of about $30,000 in student loans. Millennials has seen firsthand that too much debt can be disastrous and job security is certainly not a guarantee, so are extremely money-conscious. 4. They are aware that they need to know more about finance. 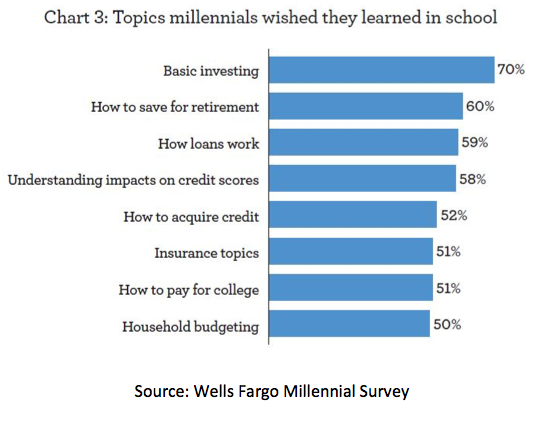 Millennials wish they had learned more about managing their money in school. They wish they had learned more about basic investing, saving for retirement, how loans work, and credit scores. About 80% believe personal finance should be taught in high school. The first step in solving a problem is recognizing there is one at all—in this case a lack of basic financial education. Because they see there is a deficit here, Millennials are motivated to educate themselves on basic financial skills. 5. This generation is still young. Millennials are between the ages of 18 and 36. Those who are just starting out in the workforce may not have a lot of money left over after living expenses and student loans are paid each month, but as they move up the career ladder, they will be better positioned to start saving. Look at the enormous difference between the $25,000 median yearly income of younger Millennials (ages 18-27) and the $48,000 median income for older Millennials (28-36). There is still time to kick unhealthy spending habits and realize the importance of living within your means. We learn from our mistakes, and as time passes will only become better at managing our money. If you are a Millennial, look for ways to show other generations you are dedicated to living within your means, pay off debt, and save for retirement. Create a written budget—and stick to it. Include all of your expenses, and make sure those expenses include a designated amount each month to be put into savings and retirement accounts. Remember to pay yourself first; saving for a future—even one that seems so far away—is essential to a lifetime of financial security. The key lesson here is don’t underestimate the Millennial generation. As the economy grows and this generation begins to find better-paying jobs, they have a chance to prove they can manage their finances just as well, if not better, than the generations before them.